He returned to the scene of his greatest triumph with an accomplished smile of satisfaction, and Will Power suggested he can now always feel that way about Indianapolis Motor Speedway. The winner of May’s 102nd Indianapolis 500 was back at the track Monday for Firestone tire testing along with four-time Verizon IndyCar Series champion Scott Dixon of Chip Ganassi Racing. That Power was able to realize a lifelong dream in his 11th Indy 500 start means the Team Penske driver has done what he set out to do, winning that race as well as a series championship in 2014. “Just more satisfaction, man,” Power said with a chuckle. “Just satisfied I got that. Then you can just go out and focus on racing and winning. Everything else is just a bonus once you’ve won this race, and including a championship. Those are the two things you need to do in INDYCAR. Now you just try to add onto that. He joked that he hasn’t worn his Indy 500 winner’s ring that much. 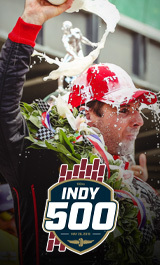 But just like Dixon, who won the 2008 Indy 500, Power is now motivated to win “The Greatest Spectacle in Racing” again. This year will always be thought of positively because of May, which also included winning the INDYCAR Grand Prix on the IMS road course. He’s the first driver to win both races at all, much less in the same year. The sweep pushed his career win total to 34, tied with Al Unser Jr., for eighth on the Indy car career list. But 37-year-old Australian Power, who is fourth in the points with four races remaining, would still like to overtake his points-leading rival Dixon for another championship. Power said this test was about accumulating data on what will hopefully be an improved front tire for next year’s Indianapolis 500 to go along with the universal aero kit that debuted this season on all cars. After another weekend off, the series shifts to Pocono Raceway in Long Pond, Pennsylvania, for the ABC Supply 500 on Sunday, Aug. 19. Power has won that race each of the last two years. Last year’s victory was a lesson in perseverance as he came back from a lap down. He’s unsure how the redesigned cars with universal aero kits will handle the tri-oval, which has different levels of banking in the turns from 14 degrees in Turn 1 to 8 degrees in Turn 2 to 6 degrees in Turn 3. Dixon, who won at Pocono in 2013, has a 46-point lead on Andretti Autosport’s Alexander Rossi after 13 of 17 races. Power is 87 points back. The ABC Supply 500 airs live at 1:30 p.m. ET Sunday, Aug. 19 on NBCSN and the Advance Auto Parts INDYCAR Radio Network.